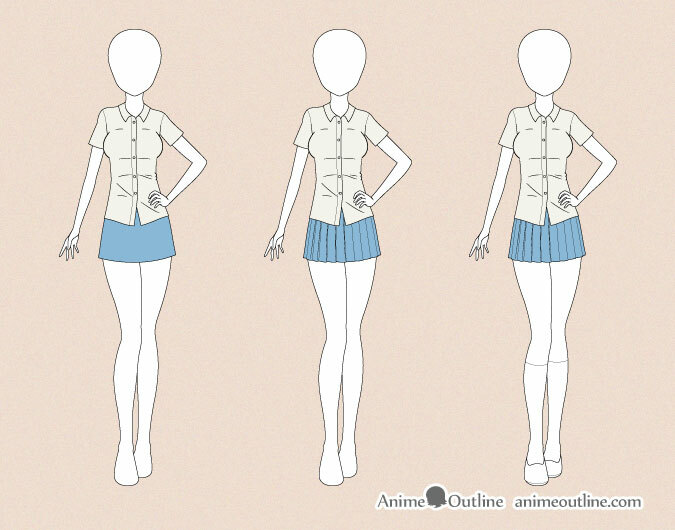 This tutorial focuses on the basics of drawing some common types of clothes in the anime and manga styles. 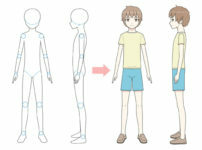 The examples shown are of female clothes but the tips can be applied to drawing male clothing as well. 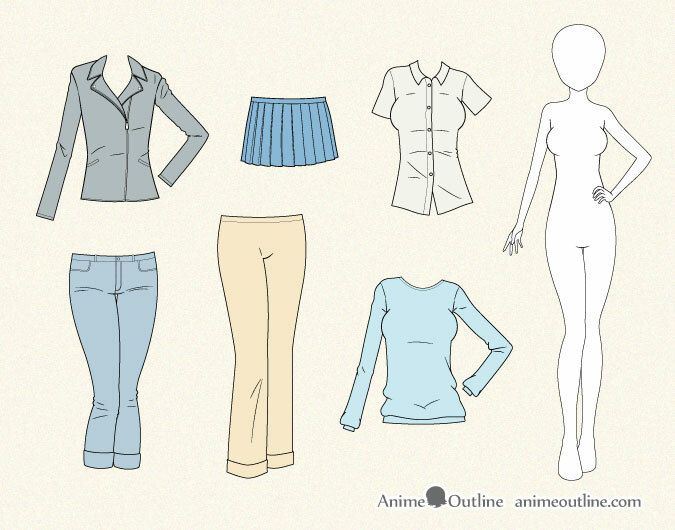 Before you start drawing an outfit it can be very helpful to study some photos of real clothes to get the general idea of the the designs and where the different parts such as zipper and buttons tend to be located. 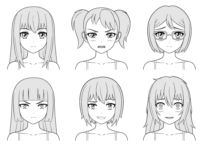 Anime and manga characters are drawn wearing different types of clothes hundreds and even thousands of times therefore their clothes is often drawn in a simplified manner. The more essential elements of each peace are shown while minor details like smaller folds are left out. 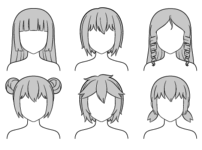 If you’re a beginner artist start by first drawing a rough sketch of the shape and pose of the body before you draw the clothes (assuming the clothes you are drawing is being worn). 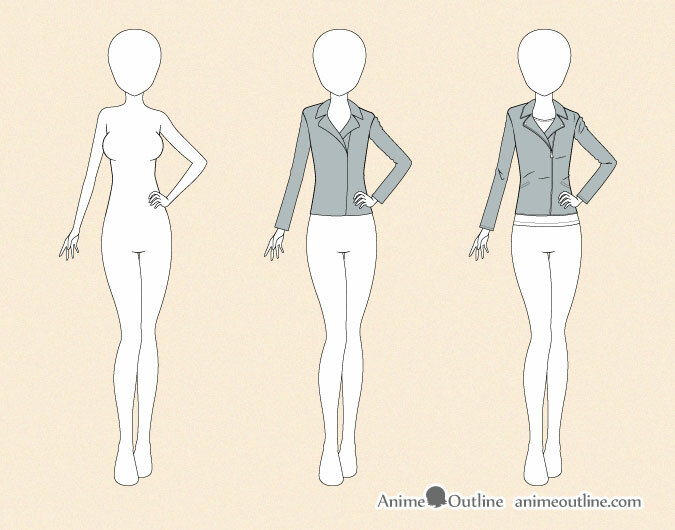 To draw an anime style leather jacket on the body start by drawing it’s overall shape and major features such as where the zipper line and collar. Leather is fairly rigid and even a tight jacket will somewhat conceal the shape of the body. The shoulder areas where the sleeves are stitched to the jacket will stick out be “pointy” while the chest area will be squeezed in. Draw accordingly. 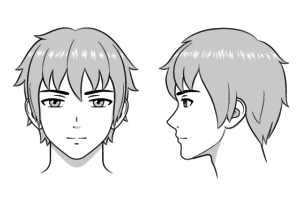 In this example the major folds will be at the shoulder (because of the slightly raised arm) and on the inside of the elbow (because the arm is bent). There will also be some light folds at the level of the upper stomach area because the body is very slightly bent to one side. 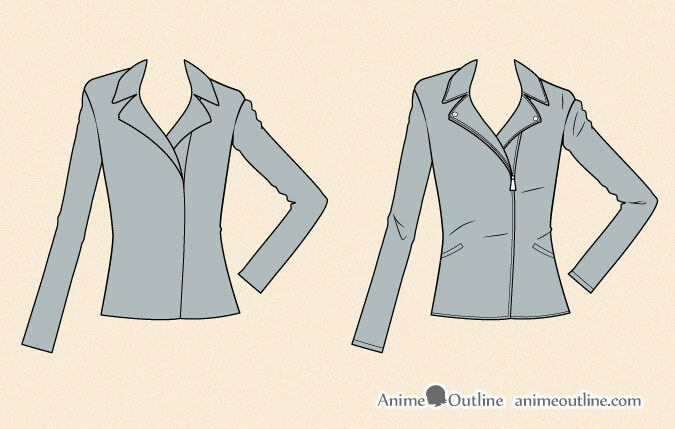 Draw the lighter folds and the smaller parts like the details of the zipper and the pockets after you draw the major features. 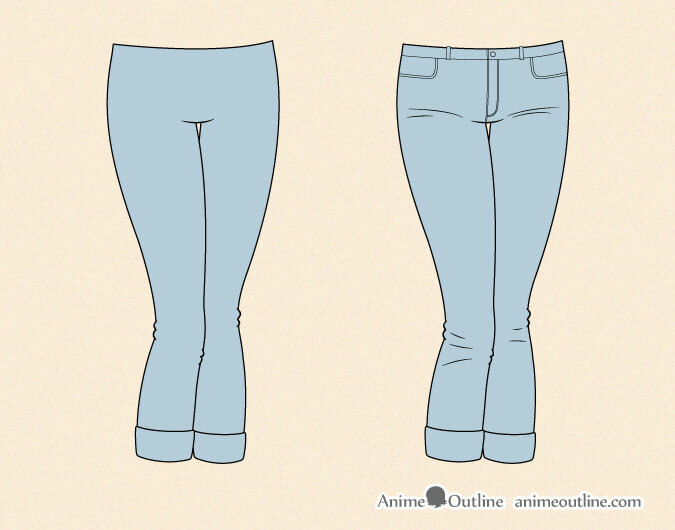 Tight jeans will almost exactly hug the shape of the legs. 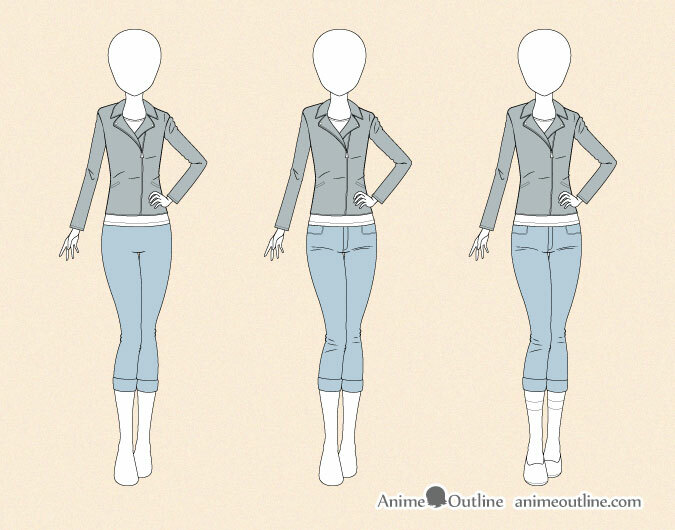 If you’ve done a sketch of the body as suggested earlier you only really need to indicate the top and bottom of the jeans to get their overall shape. The only exception in this case are the bottom of the jeans because they are rolled up. Draw the rolled up parts slightly away from the shape of the legs. The folds in tight jeans will usually be at the sides of the knees and at the very top between the legs. Draw some in those areas. 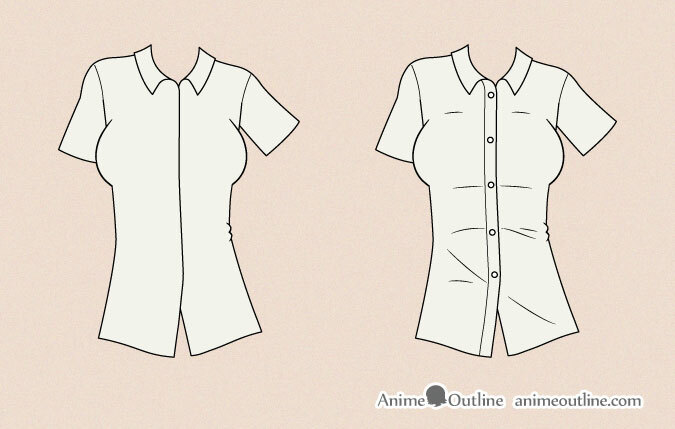 To draw an anime shirt (school uniform or other) once again start by drawing the overall shape of the shirt and it’s major features. Because shirts are usually made of fairly thin and soft material the shape of the body will be more obvious through a shirt than through a jacket. 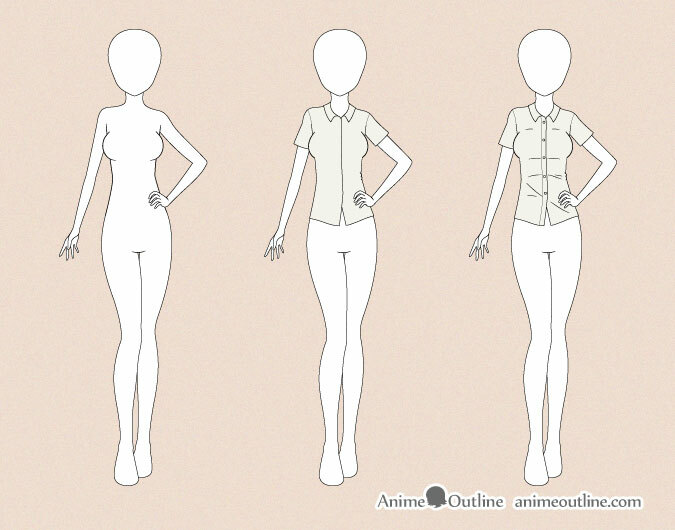 If the shirt is fairly tight and has short sleeves as in the example you only need to draw a few folds. 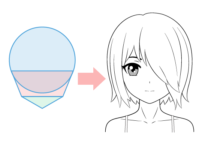 Draw some folds below and above the chest. In this example there is also one fold going across the stomach are to show that the shirt is being lightly stretched in one direction because of the light bend in the body. You can also draw some folds in the upper stomach area for the same reason. 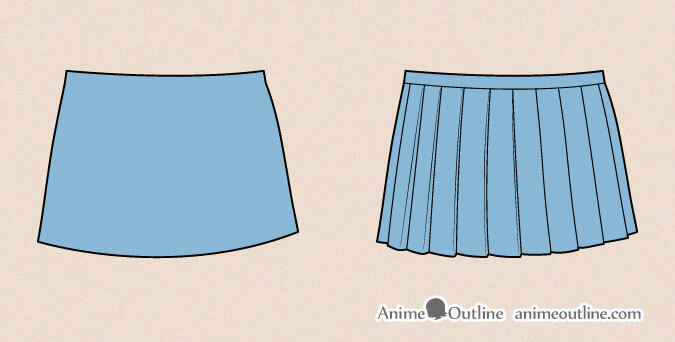 To draw an anime school uniform skirt start once again by drawing its overall shape. 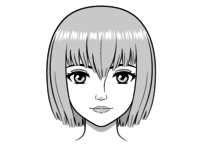 Next draw some vertical lines to indicate the proportions of the folds. 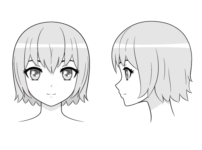 It’s important to note that the folds in this particular design will be sort of like teeth that point in one direction but slowly curve around. In this example the inner side of the folds because invisible as they progress from the left side of the picture to the right. 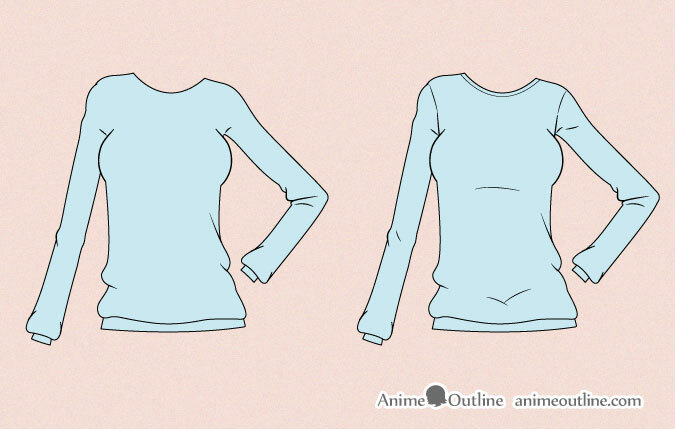 To draw a sweater in the anime style start by drawing its overall shape. Sweaters and sweatshirts are usually made of soft but fairly thick material and tend to be fairly baggy and thus tend to have a lot of folds an curves. 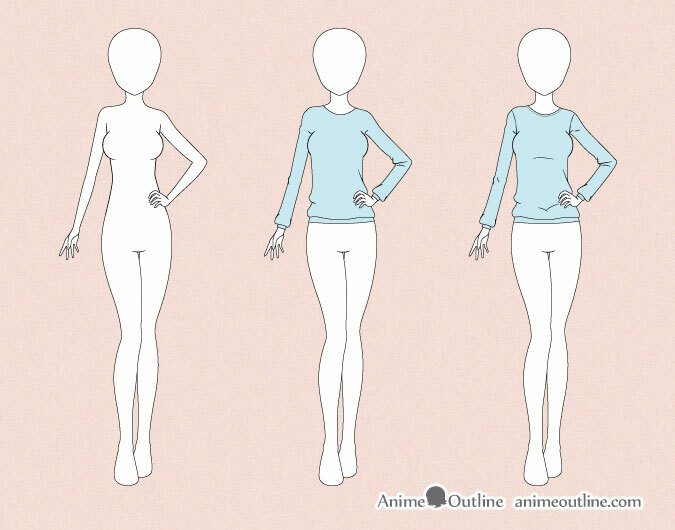 Start by drawing the overall shape of the sweater or sweatshirt with the outline of the major curves and folds. Baggy clothes will tend to hand downwards and collect at the bottom. Keep this in mind when drawing. 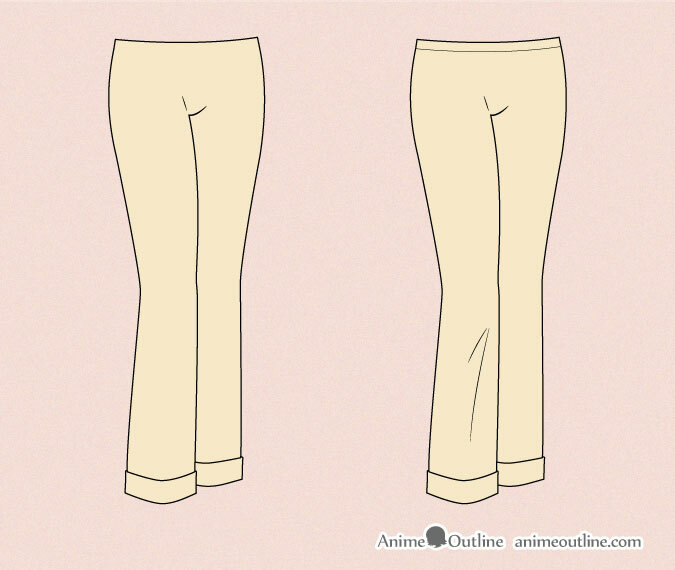 To draw anime sweat pants again start by drawing the overall shape. For sweat pants that are fairly baggy that hang down as in the example there will be very few folds. The only major folds in this example will be on the knee of the forward leg as the pants will hang off of it very slightly creating some tension. 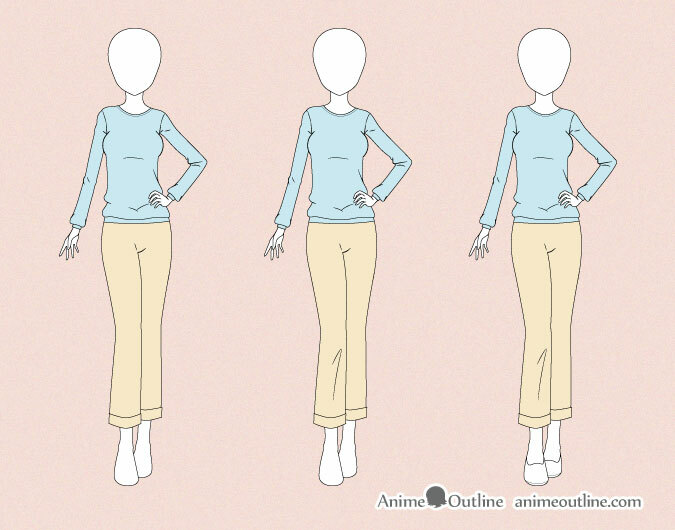 Drawing any type of closing can be a bit challenging but as already mentioned if you are having trouble drawing anime clothes look at example of real clothes.